Matt Cutts of Google who is still on leave as far as we know, was on TWIG #336 and he spent about 15 minutes going through the core updates, Penguin, the webmaster team and more. It starts at the one hour and three minute and forty-five second mark and lasts through one hour and sixteen and forty-five second mark. Matt Cutts himself brought up the topic at the 1 hour 3 minute and 45 second mark by reading the title of one of my articles on the Google core update. As you know, last week we had a large core update and the week before massive fluctuations that were confirmed as core algorithm related as well. So lots of changes were spotted. 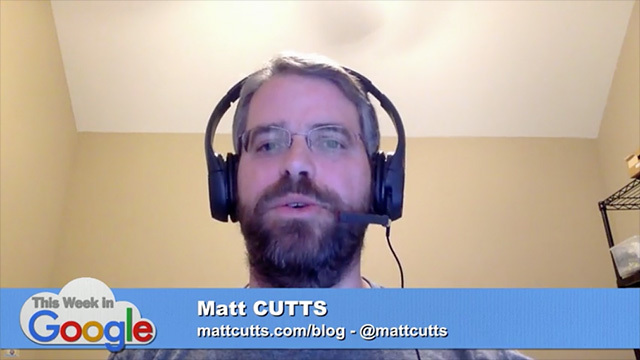 Matt Cutts explains that around the holidays Google "doesn't want to create extra stress for publishers, webmasters and SEOs." So Google "tends not to roll out a lot of algorithmic changes right in mid-December," Matt added. He then said, "then what happens is if you freeze your code then people [Google engineers] keep working then come January 1st, 2nd, 3rd, 4th, 5th... people go, okay we get to launch everything." Then Matt says "my suspicion, I don't know for sure, that this particular change, I don't think it was Penguin, it was just been a lot of stuff been building up in the pipeline and the code freeze has been lifted and we're ready to begin launching stuff. So you see a lot of changes often right at the beginning of the year cause you know, everything has been waiting to go out." Then around 1 hour and 5 minutes they get into Gary Illyes and the webmaster trends team. He then talks more about Penguin and what it may mean by it being continuously updating, etc. He does clarify that he is still on leave and he isn't involved much. But he knows more about the algorithm than most and it is worth a watch.